Aura Reading Constance Wu. Here’s a fresh look at her superb performance in “Crazy Rich Asians.” Read this and be inspired. Aura Reading Constance Wu is going to be a delight. Her performance sparkled in “Crazy Rich Asians,” naturally expressing a tremendous range of emotions. I was especially fascinated with the many degrees of vulnerability which never — not even once, to me — crossed the line into whiny victimhood. That’s unusual in any American actress, isn’t it? As with my comparison aura reading of Michelle Yeoh, here’s what I’ll be researching for us today, Blog-Buddies. You’ll learn about five chakra databanks relevant to the right-sized actress. Then I’ll also research those same chakra databanks for Constance Wu’s role as Rachel Chu. Comparing the two versions of the same person’s inner self? That’s the essence of an Aura Reading Movie Review. You can learn more about aura reading here. Why not peek? This is something you can definitely learn to do. And it’s not just entertaining but practical! You might enjoy this how-to book, an international bestseller on reading auras. (Maybe it could help you, too.) 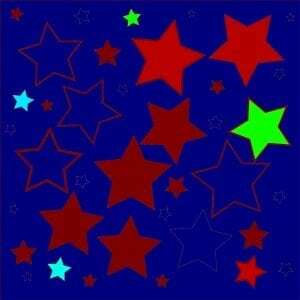 BTW, did you know that today’s aura reading doesn’t require “seeing the colours”? Please don’t be discouraged if you’re not particularly clairvoyant. I’m sure not. What matters is having good, effortless skills for energetic literacy. Then you can learn to use it in many ways. These are some of my faves. And here’s a link to a five-lesson Free Intro to Reading Auras. Online learning, on demand. Come and discover the method of Aura Reading Through All Your Senses®. Technically, today’s aura reading is an Aura Reading Movie Review. Because you gain insight into what changed, and what didn’t change, subconsciously for the performer. Simply by comparing the same chakra databanks. Which photos will I be reading today for this Aura Reading Movie Review? 42 feet, within moderate range. Strong, uncommonly strong as a person, Constance Wu leads with her power. Showing it while with others, this is a skill she’s developed, seems to me. Like making choices about how to pay attention to life and also how to adjust her personality. I’d like to give you a bit of extra introduction, Blog-Buddies. “Crazy Rich Asians” shows an already powerful, well balanced heroine… struggling against unexpected viciousness. And by this scene she’s truly committed to fighting back. Although the theme of love, and her own vulnerability, is equally important in this part of the movie… as the theme of using her power. Complex indeed! No wonder this sequence of reading five chakra databanks is going to be uncommonly fascinating. Golly, already I’m moved almost to tears. This is such a courageous showing forth of herself while with others (a crowd of people mostly unfriendly to her). The Rachel character has a strong, ineradicable personal presence. At the energetic and subconscious level where chakra databanks reveal what truly makes somebody tick… she does come first. And although clearly in this photo she’s fully clothed (quite beautifully clothed) what shows in her Root Chakra Databank for Sense of Self While with Others? Insisting upon being her own self, however others may judge her. 24 feet, within normal range. Although securely heterosexual, Constance Wu is comfortably aware of both types of energy. At the time of this photo, she leads with her masculine energy and keeps her feminine energy in reserve. Quite likely, when she’s with people she trusts, the opposite happens. What a refreshing and (if y’all don’t mind my saying) a very Age of Awakening way to make use of her energetic resources . Living now, it’s far easier for people to have full use of both masculine and feminine energies. Due to being born in 1982 — which makes her 36 years old — Constance Wu belongs to a cohort of young women who can adapt to living with much greater wholeness and resourcefulness, energetically, compared with their grandmothers. Now I understand why I burst into tears during this part of the film. 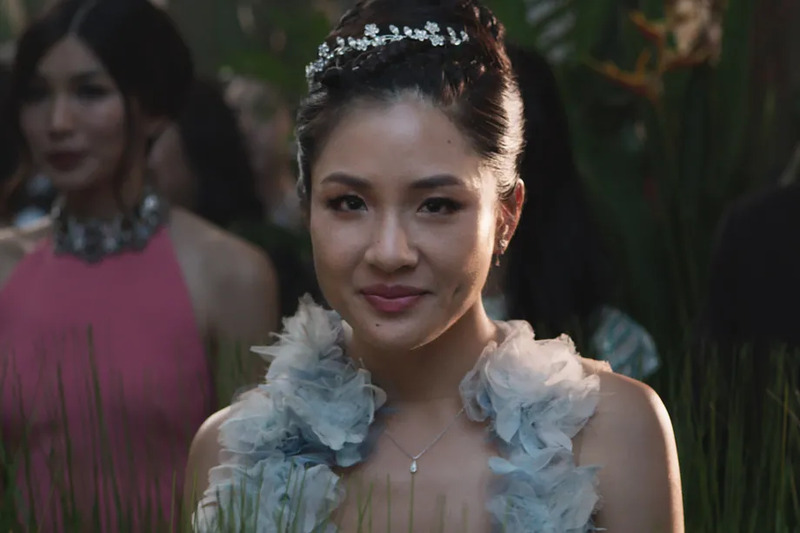 What was there about the sight of Constance Wu, seeming slightly shy, making her appearance at a social gathering in, what she knew by now, was enemy territory? Remember how, earlier in this aura reading, I mentioned how the actress leads, gently, with her power? How she keeps in reserve her softness, vulnerability, feminine energy? Well, here — in enemy territory — the character Rachel is letting that vulnerability show, plain as the gorgeous nose on her face. And that softness and vulnerability has no edge to it. Instead the actress reveals it clearly, without distortion. If you’ve ever struggled with your own vulnerability, Blog-Buddies, this part of the movie is must-see viewing. Also, if you have learned how to read auras from regular photos… As you know, that’s simple energetic literacy, Stage 3, a degree of basic competence that every one of you blog readers could develop… Please read this chakra databank on the photo link supplied to you here. Powerful, powerful learning is available to you. Like the truth in this saying, spiritual growth is caught, not taught. 29 feet — here’s another chakra databank within normal range. Tremendous inner strength is available to Constance Wu by the time of this photograph. Look, Blog-Buddies, who likes fear? Unless we’ve chosen to ride a roller coaster or watch a horror movie! But this chakra databank suggests that Constance Wu has gained mastery over fear, to a degree that most people haven’t yet. Sure, she makes this seem easy. That’s what happens when, lifetime after lifetime, a person uses free will to make good choices. In this moment, the Constance Wu character shows resolute presence in the face of fear. Definitely she feels a very strong fear, which makes it all the more significant that she’s not responding with her power. Evidently the choice she’s made is to show her softness and vulnerability, perhaps in the manner of traditional Chinese culture for a marriageable woman her age. Accordingly, she succeeds at showing that softeness even when frightened. Especially if you’re watching “Crazy Rich Asians,” this choice will make complete sense. Offhand I can’t think of another movie where I’ve witnessed anything like Constance Wu’s performance here. Out to the moon, over-functioning. At the time of this posed publicity shot, Constance Wu is turning up her emotional giving. Seems to me, this is partly her capacity as a very evolved human being (related to what I wrote about her Solar Plexus Chakra Databank for Handling Fear). Since very evolved souls become increasingly loving as they progress spiritually. Partly, this is pure acting talent. Not “acting” in the sense of pretending. But “acting” in the sense of resourcefulness, including strong connection between feeling and showing. During this photo shoot was Constance Wu consciously trying to bless the world? Or did she just do it reflexively, as the evolved soul she is? Aura reading reveals a lot, but energetic literacy stops short of mind reading. You do know this, right? Ethically it’s important. And ethics matter enormously, even for the sake of one’s accuracy as an aura reader. Nothing remotely movie star-like! Rather, what shows in the character’s chakra databank is… a person, a very human person, struggling to be kind and emotionally generous. Daring to keep her heart open and demonstrate a reasonable amount of emotional giving. At one point in the movie, what is the mother, Eleanor Young, doing? Leading a small group of women reading the New Testament. While their behavior couldn’t be more catty, controlling, and uninterested in spiritual connection. Social satire pokes gentle fun at the hypocrisy of these totally un-Christian, pseudo-Christian, crazy rich women — even as they go through the motions of reading the Bible. By contrast, the Rachel character is delivering the real deal: Opening up her heart. Long as I’m interjecting a personal note, I’ll add that this is an Age of Faith approach to loving God and navigating tricky relationships. However, if you’re looking for an incredibly touching, heartfelt example of this Christian ideal at its most human– I doubt you can do better than Constance Wu’s restrained and deeply authentic performance. Let’s remember, this is just during a publicity photo. And the balance of giving and receiving, emotionally, is magnificent. Especially since the quality of emotional receiving is more like a habit of balance. Like she’s giving, so automatically she’ll also receive. Definitely don’t let the size of this chakra databank fool you. No way would I call Constance Wu emotionally “needy,” requiring adulation from her fans in order to feel as if her life has meaning. No way! Personally, I find that Wu’s particular balance of emotional give-and-take, during this celebrity photo shoot, to be magnificent. What a self-actualizing person she is! 2 inches. Nearly shut-down, close to it. Here’s such a realistic touch! That teensy chakra databank for emotional receiving — this is as close as Rachel comes to protecting herself in this scene. Although she’s not completely shut down emotionally, regarding receiving from others, she’s prepared to be hurt. No wonder this chakra databank shuts down nearly completely. Courageous, and even Christian, as this character may be, she is no sap. Wow!! Another wow. Thank you for this, Rose. That article also includes a better version of the picture you used to read her aura. Gorgeous picture of her. I really like that dress. ISABELLA, you’re so welcome. And thanks back to you, for all you’ve written here. Looking forward to reading that article later today! Meanwhile, I agree with you about the dress. This movie is loaded with fantastic dresses and, as EMILY TURNER, put it “interiors.” (In Comment #5 at the Michelle Yeoh aura reading.) Also food, as I already mentioned. Wow Rose, she is so inspiring. I want to go see the movie again! She was a pleasure to watch in the movie and to listen to in all the interviews I’ve since seen. I was already impressed by her but am more so after this aura reading . The acting was superb, the costumes dazzling, the kissing uncomfortable to watch and the novelty of seeing this part of the world in a Hollywood movie engaging for a while. But at the end of the day one needs a good story. Things picked up in the second part of the movie. I loved this aura reading. Of special interest was the section on how she handles fear, in real life and as portrayed in the movie. How remarkable to have gained mastery over fear, far beyond what most have attained. That might be one attribute of a hero. Or an attribute of “this” hero. I am so enjoying the hero theme in its many forms.